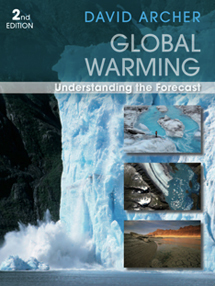 Global Warming: Understanding the Forecast is a comprehensive introduction to all aspects of global warming. Written in an accessible way, and assuming no specialist prior knowledge, this book examines the processes that control climate change and climate stability, from the distant past to the distant future. Second Edition now shipping. Thoroughly revised and updated but basically the same material. On-line interactive computer models allow you to play with the physics and chemistry behind the global warming forecast. Global Warming: The Science of Climate Change is running now on Coursera, a not-for-profit education company that partners with the top universities and organizations in the world to offer courses online for anyone to take, for free. The video lectures have been completely redone in a punchy 2-10 minute format, with revamped exercises using the updated online models interspersed throughout. Open Climate 101 brings the experience of University of Chicago class PHSC13400, part of our "core" science curriculum for non-science major undergraduates based on this text, to the internet at large. However, this class seems supplanted by the updated content in the Coursera class (above), so unless lots of people request otherwise, Open Climate 101 will shut down on or about Jan 1, 2014. Videos of lectures, both in ~45 minute classroom format (recorded Fall, 2009, University of Chicago), and in a 2-12 minute topical format intended for on-line learning (recorded Summer, 2013).